I have decided to make baked cheesecakes as Christmas gifts, but I am wondering about freezing them so that I can make them early. What is the best way to freeze them, and how long can they stay frozen? Yes – you can freeze cheesecakes. I do it all the time – cheesecakes freeze incredibly well. I have frozen them over a month and they were great! This is the wonderful thing about cheesecakes, is that you can freeze them ahead and use later. Freezing for more than a month is not recommended to retain the best quality. Cool the cheesecake completely before freezing. 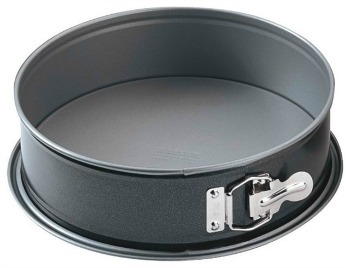 To use bottom of springform pan – Remove the outer rim (sides) of the springform pan, leaving the cheesecake sitting on the bottom of the pan. I then wrap each cheesecake (with the bottom of the pan) with several layers of plastic wrap and then a layer over the outside with aluminum foil. To use a cardboard bottom – After the cheesecake is completely cooled, use a knife to separate the cheesecake from the pan bottom. Slide it onto a foil-wrapped piece of heavy cardboard. Then wrap each cheesecake (with the bottom of the pan) with several layers of plastic wrap and then a layer over the outside with aluminum foil. For a cheesecake with topping – such as fruit, always freeze cheesecake WITHOUT the topping and add the topping before serving. Always thaw a cheesecake overnight in the refrigerator. When partially thawed, transfer it from the cardboard or springform bottom to a serving plate. I remove the outer rim of the springform pan and leave the cheesecake sitting on the bottom of the pan. Then wrap with several layers of plastic wrap. They do not fall apart if you do this. Also check out above on using a cardboard bottom. Can I freeze cheese cake with sour cream topping? I freeze cheesecakes all the time, but not with sour cream topping. For a cheesecake with topping – such as fruit or cream, always freeze cheesecake WITHOUT the topping and add the topping before serving. this is when i would freeze cheesecake. If you freeze your cheesecake, do not add the topping until you decide to defrost. After defrosting, then apply the topping before servings. Can i freeze a no bake baileys cheese cake that contains whipped cream thankyou. Yes, I see no reason that you can not freeze an already prepared cheesecake containing whipped cream. Can you freeze cheesecakes if you use heavy cream in the ingredients instead of sour cream? Can you freeze a baked cheesecake, if you use heavy cream in the ingredients? Yes – Thaw a frozen cheesecake that contains heavy cream in the refrigerator rather than on the counter. You need to first cook the cheeses and then let cool before freezing. I bought a cheesecake that was frozen and thawed. Can I re-freeze it? I, personally, would not refreeze it. Refrigerate instead. I froze my cheesecake in a plastic cake carrier….very tight fitted…will it be ok. I would pack it in a cooler with ice during the trip. I would probably leave the cheesecake in the springform pan you cooked it in. Wrap the cheesecake well to prevent any ice or water from touching the cheesecake. Check out my web page: How To Freeze Cheesecake. I have a smooth chocolate glaze (chocolate & butter) on my cheesecake. Is it ok to freeze with it on, or wait until the day to serve to put the glaze on? We recommend to always freeze a cheesecake without toppings, then add the toppings after thawing. I made 2 cheesecakes with canned fruit topping blueberry and cherry but party is next Saturday!!!!! My mistake. Can I freeze . they are covered with cool whip. Help! Last Christmas I made ahead 4 fruit filled cheesecakes, wrapped them very well and froze them for about 3 weeks before the holiday. Mine were filled with fresh (cooked with cran juice, cornstarch and sugar) cranberries. When I thawed the cakes, I then added the same fruit as topping. I was amazed at how well the fruit filled cheesecakes tasted, everyone raved about them. I was wondering if it would be okay to freeze the cheesecake filling for the cheesecake and let it thaw later. I would then put it in the pan and bake it . Would that be okay ? I haven’t tested it out myself, but from what I read, you can freeze the cheesecake batter, and then let it thaw out in the refrigerator until softened before baking in a cheesecake pan. Maybe someone else can chime in that has actually tried this. Would this method work for mini cheese cakes? I bake them in cupcake papers. I would like to know why when I defrost my frozen fruit filled and whipped cream topped cheesecakes there is water in it, Could it be from the filling or the type of whipped cream used for the topping. Please advise. Will the crusts be soggy when defrosted?